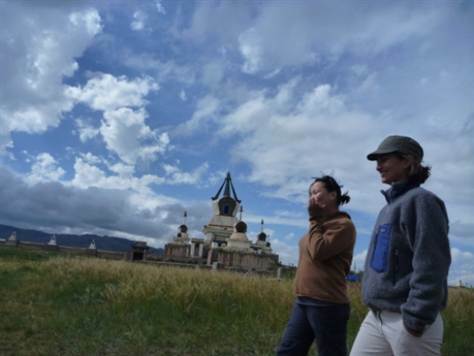 West Virginia University's Amy Hessl and a colleague walk through a grassy area in Mongolia's Orkhon Valley, which features monasteries and other historic sites. Beginning in the 13th century, the Mongol Empire spread across Asia and into the Middle East like wildfire, growing into the largest contiguous land empire the world has ever seen. Historians have long speculated that periods of drought pushed the Mongol hordes to conquer their neighbors, but preliminary new findings suggest that theory may be exactly backward. Instead, consistent rain and warm temperatures may have given the Mongols the energy source they needed to conquer Eurasia: grass for their horses. This idea, bolstered by the discovery of tree rings that preserve a climate history of Mongolia back to the year 657, is still in the preliminary stages of investigation. LiveScience spoke with Amy Hessl, the dendochronologist, or tree-ring researcher, who along with collaborators Neil Pederson and Baatarbileg Nachin first discovered the preserved trees hinting at the weather during the era of the Mongols. LiveScience: How did you find the trees that held the Mongolian climate record? Hessl: We were funded by the National Science Foundation and the National Geographic Society a few years ago to look at how climate change is impacting wildfire activity in Mongolia. So we had driven by this lava flow that looked reminiscent of other places I know of in the American West that have really long climate records from tree rings. The trees growing on these dry, exposed sites tend to grow until they're really old. And then once they die, the wood decays slowly. It allows you to reconstruct environmental conditions going back a very long time. We drove by this lava flow, and I was like, "Whoa, that looks like an ideal place." So we went back, and even when we did sample, we didn't think we had anything that great. We were just throwing these pieces of wood back and forth to each other, like, "Oh, we'll make this one into coffee table art." We weren't taking it real seriously. LiveScience: How did you realize that you'd found something important? Hessl: I gave them to my colleague Neil Pederson [of Columbia University's Lamont-Doherty Earth Observatory]. He didn't look at them for months, until finally he didn't have anything else to do, so he started to date them. I started getting these texts from him on a Friday night and he was like, "I'm back to the 1200s." Finally, I get this text that just had three numbers on it, 657. I was like, "What was that, does he want me to call him at 6:57 in the morning?" It turned out to be the date of the oldest, most inner ring, 657 C.E. There are certainly other tree-ring records that go back much farther, but this is special for Mongolia because it clearly covers the period of the rise of [Mongol Emperor] Genghis Khan. LiveScience: How can tree rings tell you what the past climate was like? Hessl: These trees are growing on this lava, and there's very little soil development, so they're really, really water-stressed. When the tree rings are narrow, that tells you that during its growing season there was very little water available. The bigger the rings, the wetter it was. 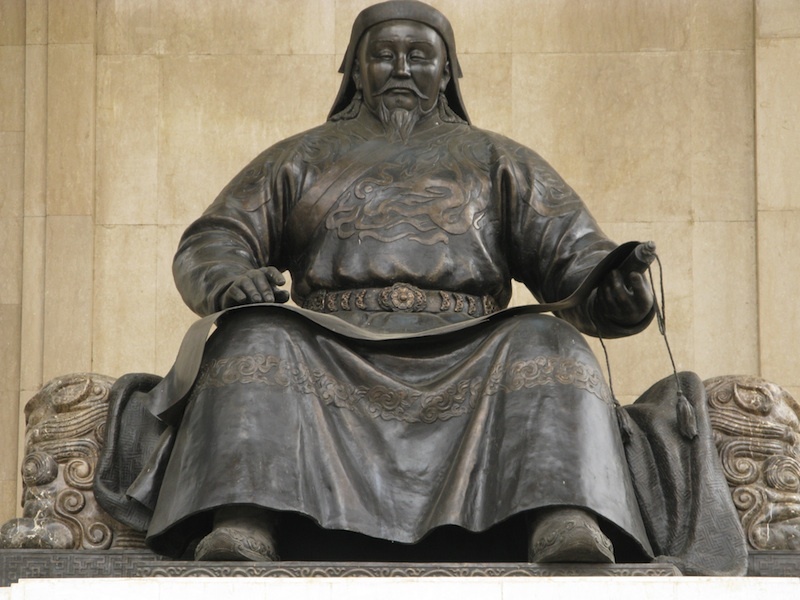 LiveScience: What sort of climate patterns did you see as the Mongol Empire arose? Hessl: It's very preliminary, but in the couple of trees we have in that time period we can see that the rings are not only wide, but they're consistently wide for the time that overlaps with the rise of Genghis Khan. Our inference there is that this would have been an ideal time for high grassland productivity on the steppe, and that maybe translated into more livestock, especially horses for the Mongols. To put it in perspective, each Mongol warrior had 10 horses at his disposal. Just right there, that's a huge amount of biomass that is required. In addition to that, when the Mongols expanded their range in their traveling and marauding, they brought with them large numbers of livestock that they used to feed themselves. Their whole military operation was basically predicated on the fact that they had large numbers of grazing animals. These climate conditions would have given them more energy to fuel their empires. LiveScience: What happened later on during the Mongol era? Hessl: There's a well-known cold period that occurred after a volcanic eruption in 1258, and we can see this plunge into cold, dry conditions in Mongolia. At that same time, right around 1260, the Mongols moved their capital city out of the steppe and into Beijing, and we think it's possible that was related as well. We have a historian, Nicola DiCosmo of the Institute for Advanced Study, we're working with who is going to go back through all of the Chinese documents, Mongolian records and European accounts to try to see if there's information that would corroborate our findings or not. LiveScience: Are you going back to Mongolia? Hessl: I'm leaving in a week, actually! We're going to go back to the same lava flow and collect additional samples because we didn't really put our hearts into it the first time. We were only there for a few hours. We've also identified some other lava fields in Mongolia that we think may have a similar ecological setting. We're also collaborating with some other people. One is Avery Cook Shinneman of the University of Washington, who studies lake sediments. She's going to be taking cores out of lakes in the Orkhon Valley, the seat of the Mongol Empire, looking for a little fungal spore that lives in livestock feces. What we're hoping is that we can get some general numbers and density of the livestock around these lakes going back in time. LiveScience: What do you find interesting about linking past climate to history like this? Hessl: It's fascinating to think about the energy sources that previous civilizations were dependent on, and when those energy sources were abundant how those societies responded, and when those energy sources evaporated, how did they adapt to that? Society today is dealing with major threats to our primary energy source, so it's fascinating to me to look back on these earlier civilizations to see them going through the same transitions. It just puts our current situation in perspective.